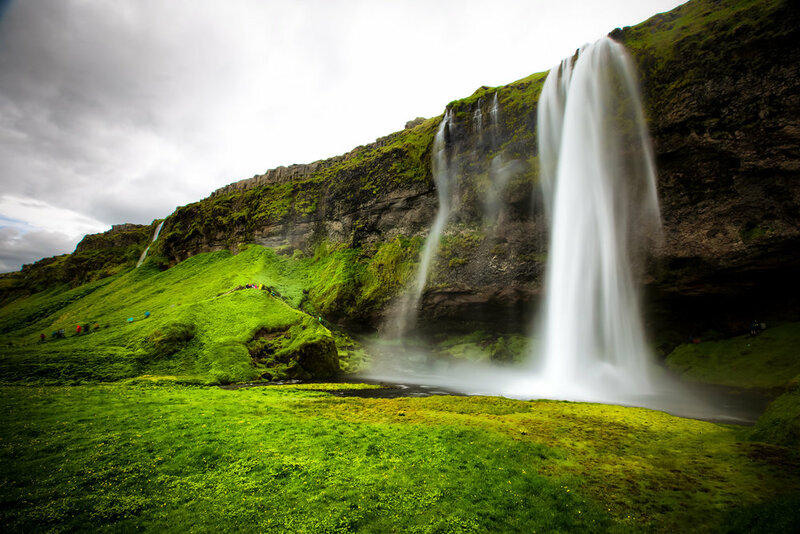 If you’re not a fan of waterfalls, its safe to say that you’re probably not really going to enjoy a trip to Iceland. 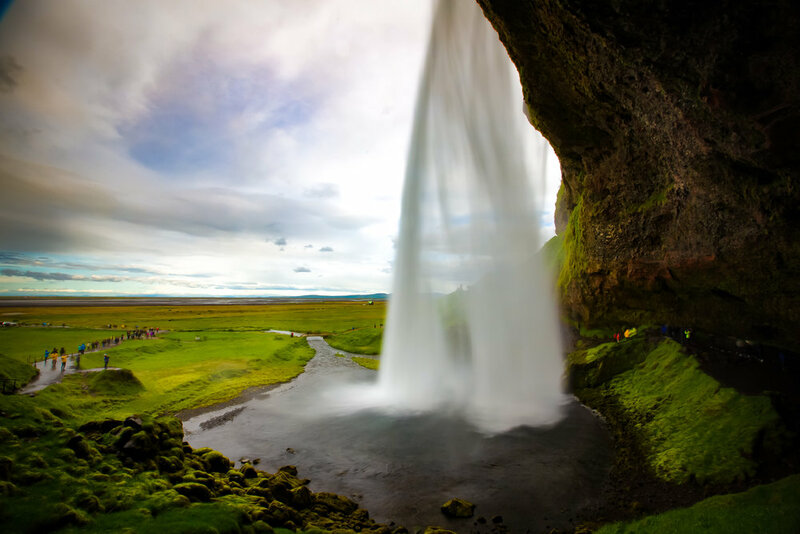 Sure, there are a lot of other things that you can spend your time on when you visit the country, but you’re going to quickly realize that no matter where you go, there is surely a waterfall nearby. Iceland is home to a countless number of waterfalls with each one of them unique in its own way. 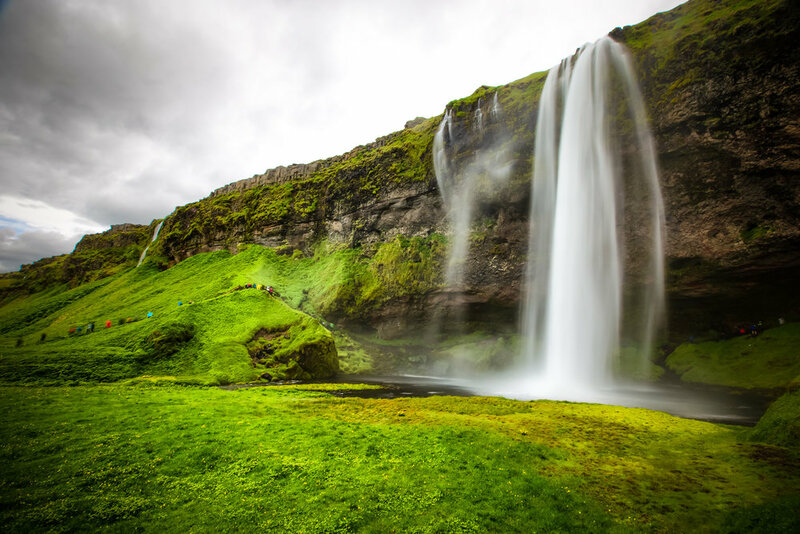 The common feature of all of them is that they are a testament to the beauty of our planet’s natural environment and are one of the many reasons why so many people have been attracted to Iceland in recent years. 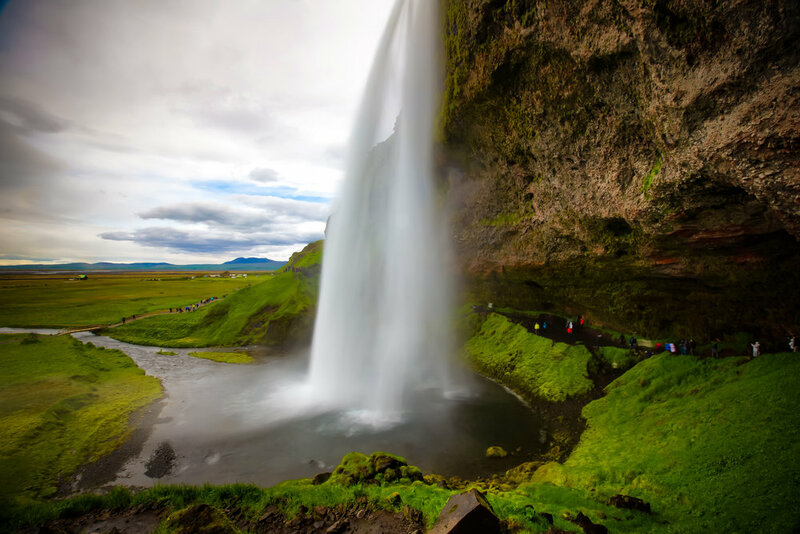 One of the most popular and highly visited of those is the beautiful cascading Seljalandsfoss falls in the south of the country. At sixty meters in height, it is one of the highest waterfalls in the country but arguably its most attractive feature (and one that makes it so popular with tourists and photographers alike) is that you can easily view it from the front and from the cave behind! The water from Seljalandsfoss sources from the glacier-volcano, Eyjafjallajökull high in the mountains above the waterfall. If you’re anything like myself, you probably have a hard time pronouncing pretty much all of these complicated Icelandic words - You are however very likely to have heard of this glacier-volcano though as it attracted world-wide attention in 2010 by causing mass disruptions in international air travel when it erupted and spewed ash all over Europe. Local authorities have constructed a walkway around the waterfall which allows visitors to view it from several different vantage points. Visitors who don’t mind getting wet can even take turns walking down to water-level at the rear of the waterfall to get those all-important travel shots. Once you’ve walked around the perimeter of the waterfall, you’ll probably want to take some photos of it from the front. If you’ve got some time, you may also want to consider walking down the pathway to the left of the waterfall to an area where there is a hidden and somewhat obscure set of falls. Visiting Seljalandsfoss doesn’t particularly require a lot of time but depending on the amount of tourists you could get stuck waiting in line on the path to the rear of the falls. It is well worth the wait though, so try not to get too frustrated. You’re going to need a raincoat, or something to protect yourself from the cold mist. The waterfall is quite high, so it produces quite a bit of mist both in the front and in the cave behind. You will get wet, so its important to protect yourself. It is a relatively short walk from the parking lot to the waterfall and the cave behind, but it is recommended that you wear proper hiking footwear when visiting. As mentioned above, the mist from the waterfall makes everything wet and the trail tends to become very muddy with all the people walking around it each day. Likewise, if you are visiting during the winter you are going to need to take extra precaution when visiting. 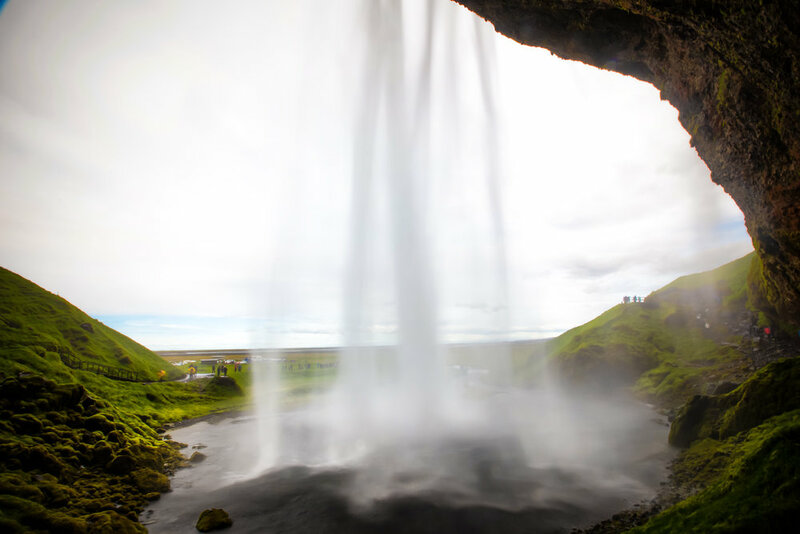 As one of the top locations or photos in Iceland, you’re very likely going to want to take photos while visiting the waterfall - This can be a bit difficult with the amount of mist that fogs up your camera’s lens. You’re going to want to make sure that you have something that you can safely wipe your lens with in-between shots. When taking photos, be patient and make sure you take a lot of shots before you leave. You may end up getting back home and realizing that you’ve lot water spots all over your lens. Better safe than sorry! If you are visiting during the summer months, one of the best times of the day to visit the waterfall - for the most iconic photos - is at midnight when the sun is setting. This might be difficult to schedule if you don’t have a lot of time, but your photos will be much better than mine if you can find the time! Seljalandsfoss is a one hour drive from the southern town of Selfoss, or a 120km drive from the capital city of Reykjavik along the Ring Road (Route 1). Getting to the waterfall is quite easy and if you start early enough could be included as part of your tour around the Golden Circle. While driving along the Ring Road, it is pretty much impossible not to notice the waterfall in the distance. If you’re one of those people who always keeps their eyes on the road though, rest assured that there are signs that will let you know when to turn. 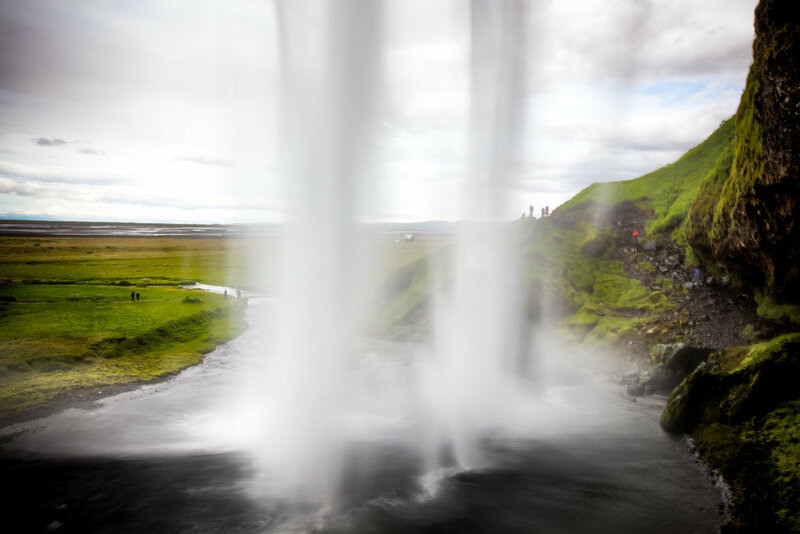 Seljalandsfoss is located along Þórsmörk Road #249 and conveniently has a large (paid) parking lot that offers tourists the quickest access to the trail that leads to the waterfall and behind it. Once you’ve parked your car, the waterfall is a short walk from the parking lot. If you’ve decided that you won’t bother renting a car while visiting Iceland, you’re going to have to rely on public transportation to get to the waterfall. There are tours out of the capital offered by tour groups like Reykjavik Excursions which offer tourists access to several different stops for around $100USD. It is important to remember that if you want to book a tour that you should do so well in advance as the seats on the daily tours tend to fill up quickly. Before you reach the trail there are public restrooms, a gift shop and a coffee shop offering drinks, sandwiches and delicious-looking desserts. As one of the most highly photographed locations in Iceland, you can most certainly expect to meet up with busloads of other tourists whenever you visit. Don’t let that deter you, this waterfall is one of the most popular for a reason and if you have the chance you visit you are definitely going to enjoy yourself while getting wet and taking beautiful photos!